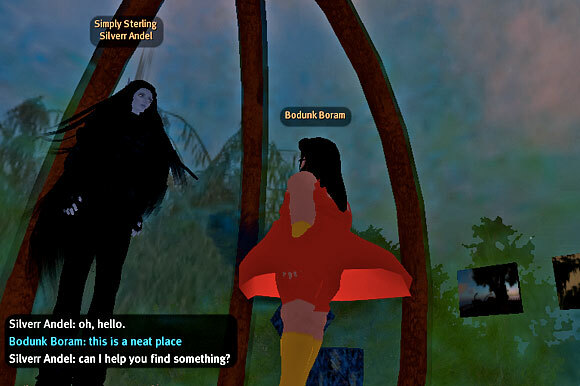 Bodunk Boram, my misunderstood avatar in Second Life, was up for adventure last night. 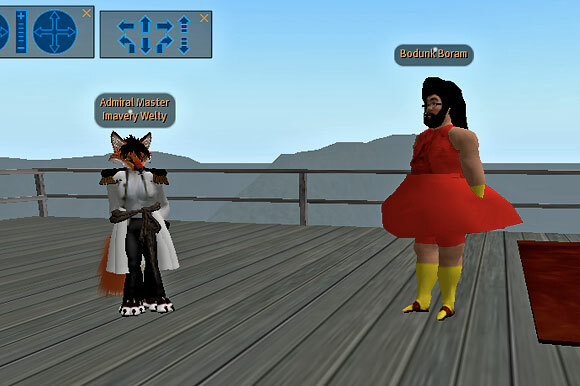 It had been months since this obese man in a red dress had explored the empty, weird virtual world. He was curious to see if anything had changed. 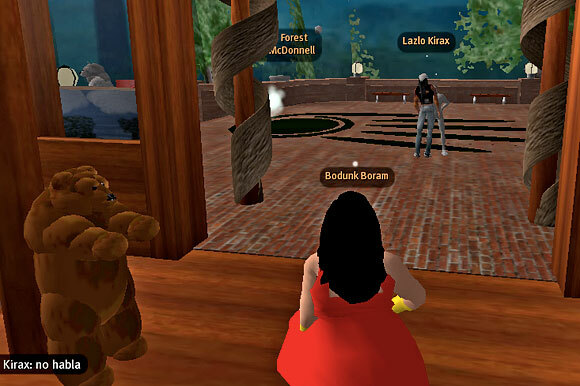 Bodunk jacked into the metaverse with innocence and wonder. As I was still banned from my old haunts, I randomly clicked on the map and ended up near a fox in an admiral’s coat. The fox was the strong, silent type. We stood on the wooden deck of his house for a few minutes. I was hoping he’d initiate a conversation, but no luck. I took to the skies and flew northward. Not far from non fantastic fox was a large block of beach front condos. According to the map, there were two people inside. I went from door, ringing the buzzers and looking into the windows. A lady in a rather hot outfit unlocked one of the doors. She was listening to music with a bald man named Nathaniel Baxter. Their apartment was sparse and boring. “There are vacant apartments on the lower level,” the lady mentioned. Rather than take her hint, I wandered up the stairs of her apartment and plopped myself down in a comfy chair. The second floor was furnished like a bed and breakfast. Very homey. The lady seemed offended by me sitting down. Bodunk sitting in a chair. “I’m going to arm my orb,” she threatened. But the lady wouldn’t listen to reason. Her orb launched me off the property and into the neighboring woods. I dusted myself off. It was clear that this meant war. And what better way to fight a war than with a deluge of red cubes! Rooms with a view…OF CUBES! The first batch of cubes were placed on the ocean side in order to block the virtual world-class views. Then for good measure I surrounded the rest of the property. It wasn’t long before I was confronted by the someone. Rather than hear me out, I was banned from the apartments. An invisible wall marked with a repeating “NO ENTRY” marked the boundary. Luckily, I could still rain cubes from outside the wall. The landlord came to find me again. “What is your problem? !” Bill yelled. 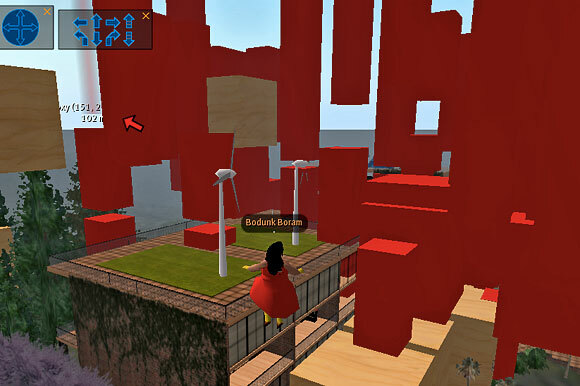 In response, I built more red towers between us. Then some more. 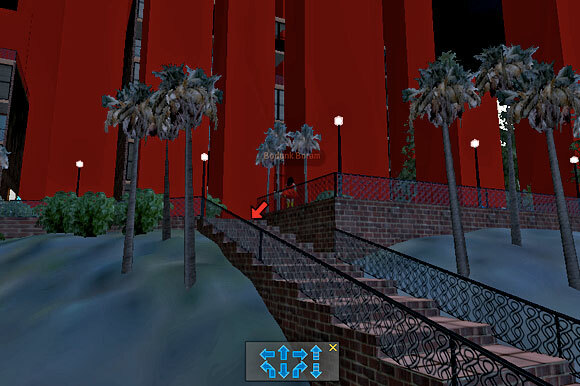 By now, it was daytime in Second Life. I flew around to view my handiwork and noticed a message waiting in my inbox. I clicked it. Apparently one of the other residents was annoyed with my cubes too. I explained the situation to her, but she was uncompromising. Well, time to move on. 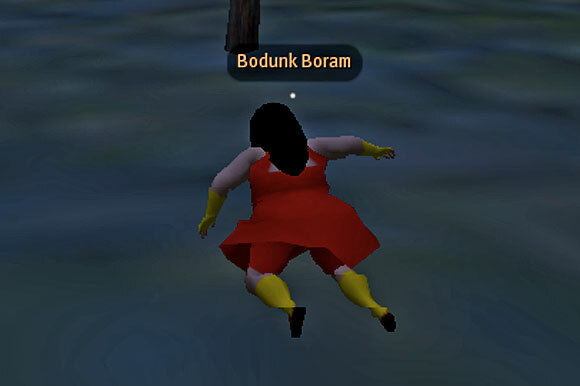 Bodunk teleported to another random region. Sitting by the dock of the bay, on a piano bench, were a shirtless man and a woman in the shiniest boots I’ve ever seen. They were voice chatting in Spanish as I approached. The man laughed. Ja, ja. I wandered around their property, splashing in the fountains and trying to make out what they were saying. It was then that I got a message from the owner of the apartments. 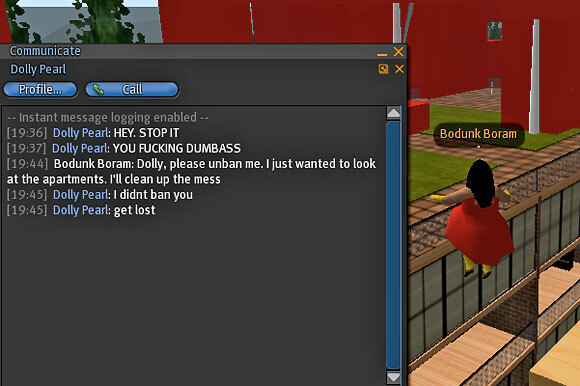 She had contacted Linden Labs and was working on banning me from the world. Good luck with that. 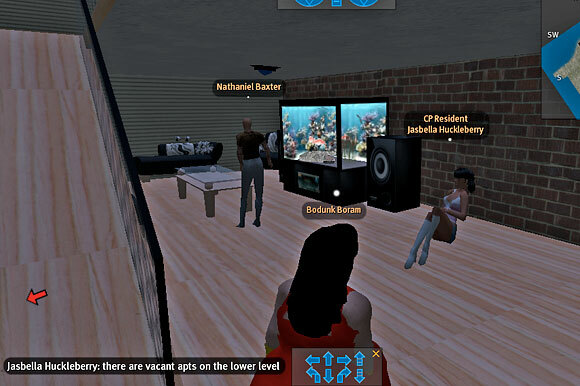 Out of all the crazy stuff going on in Second Life, I highly doubt Linden is going to care about a few red cubes. Maybe they should be more concerned with people who freak out when someone sits in their chair. After whistling goodbye to the Spaniards, I wandered down a road and discovered a weird area called Bear Plaza. It looked like a cross between a lodge and a mosque. There were bear sculptures and large mushrooms decorating the landscape. A surprising amount of aimless people had congregated in Bear Plaza. Why? No one seemed to pay any attention to me. Most were bumping into signs, reading ads, and chatting in pairs. Everyone sounded stoned or tired or both. It was a hopping place. Bodunk and the bikini lady. Trying to put a wedge between two lovers. Weird scene: cyborg warrior preaching to a bird robot. I teleported to another random location and stumbled upon an tall man (woman?) sitting alone in his treehouse. He looked a bit like Marilyn Manson. The goth in the trees. “This is a neat place,” I told him. He was nonplussed. I went on my way as quickly as I came. Bodunk was getting bored. He stopped at a lounge for some dancing, but his heart wasn’t in it. The other dancers seemed stiff, the music wasn’t very good, and the drinks were pricey. 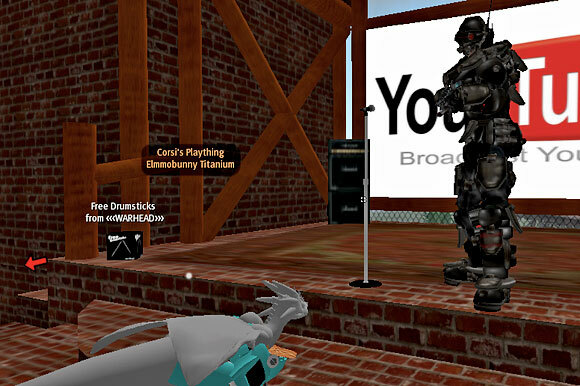 As Bodunk slow-dance v3’ed to the music, he wondered if he would keep coming to this weird virtual place. Was it he that had changed? Despite the constant upheaval and limitless new terrain and people, Second Life felt cold and vacant. The big legs at the door to the club. Bodunk struts his stuff on the dance floor. Like Dallas, there was nothing more to do.